1.Press the Mode button and switch to DLNA mode for iOS iPhone iPad. 2.Connect iOS device to the dongle WiFi with the password on WiFi setting. 3.Control Center > Airplay Mirroring > Choose dongle, TV will share your screen immediately. 4.When the first use please set the dongle connected to Wi-Fi router. Connect your iOS device to the hotspot of dongle. Open web browser > Visit 192.168.49.1 > Choose Wi-Fi setup > Select your Wi-Fi router > Input password > Connect. 1.Short press the MODE button and switch to MiraCast mode. 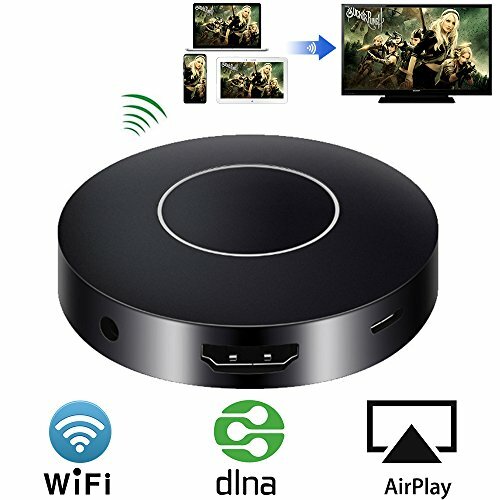 2.Open Miracast switch on your Android device and choose MONTOVIEW-XXXXX, the device will automatically connect. 3.After the connection is successful, TV will automatically share your screen. 4.There are different names of Miracast on different Android devices, such as WIFI Display、SmartView、Muti-screen display、WLAN Display、Wireless Display etc. For Windows 10 and above system PC, Press the [WIN] +P, find the wireless display function and connect the dongle. case of WiFi stability, the MAX transmission distance can be up to 4 meters. other websites). Please double check whether to accept that before purchase. Compatible with IOS 8.0 and above ( Such as iPhone 8 X 5 5S 6 6S SE 7 7plus, iPad Air, iPad Mini, iPAD Pro) and Samsung Android device 4.4 and above ( Samsung S3~S6, Note 3-7). Please double check whether your phone's version is compatible before you purchase. Due to the copyright protection (HDCP), public sharing of the contents on the screen may be prohibited by some video service providers (such as Netflix, Amazon video, HULU and other websites). Also Works with iOS 11. If you have any questions about this product by BOSCHENG, contact us by completing and submitting the form below. If you are looking for a specif part number, please include it with your message.